A longtime favorite of many Country artists, this harp is always ready to express your spontaneous musical soul. The Old Standby has standard tuning. 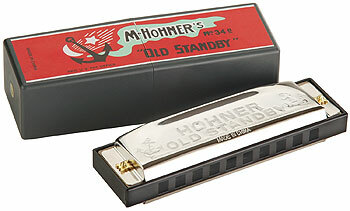 The Hohner Old Standby is a good harmonica for beginners but I consider it an economical instrument. If you would like an economical instrument you might as well save you’re money and get the Hohner Blues Band. The Hohner Blues Band is a very good instrument for beginners and it’s a bit less expensive. Perfect for harmonica beginners and hobbyists, this is classic harmonica sound with its own case. Your faithful friend. Whether you’re riding high, singing the blues or just waiting on a train, this is the harp that will get you through. Take it with you wherever you go. A longtime favorite of many Country artists, this harp is always ready to express your spontaneous musical soul. The Old Standby has standard tuning. I have a very, very old M. Hohner Old Standard Key of C. Made in Germany. Could you tell me the value. It is in excellent condition still in box.